It is a great day for America and the democratic principles we've sworn to defend as service members. The Department of Defense has recently established the first Hindu Military Chaplain program in American history. Army Captain Pratima Dharm, who currently works as a Chaplain Clinician at Walter Reed Medical Center Hospital, took on her new role as the Army's first Hindu Chaplain as of May 16. "It is an honor to take on this incredible role supporting military members and their families serving in our Nation's Armed forces," says Chaplain Dharm, who holds degrees in Psychology and Theology. Chaplain Dharm earned her commission in the U.S. Army in 2006 and in 2008 was selected for the Army's Clinical Pastoral Education Program (CPE) while serving in Iraq. Her awards include the Bronze Star Medal, Army Commendation Medal, National Defense Service Medal, Iraq Campaign Medal and Global War On Terrorism Service Medal. No stranger to achieving "firsts," Chaplain Dharm is also the first female Chaplain of Indian descent in the United States Army. Chaplain Dharm learned of this program after reading a flyer developed through the Office of the Secretary of Defense's (OSD) Chief of Chaplains office. As an Air Force officer stationed at the Pentagon, I had the distinct pleasure of serving as the action officer for this effort. I came across the opportunity after reading about three individuals who led Hindu services at the Pentagon. The three lay leaders leading the services, Mr. Bhuj Gidwani, Hitul Thakur and Dr. Ram Bhat, informed me there was an official DoD endorsement for a chaplain, however a candidate had yet to come forward. Unsure of the collective interest in such an effort, I teamed with the lay leaders to develop a flyer to find out what the need was. We circulated the flyer throughout the Hindu community. A few months later, Chaplain Dharm contacted me and indicated she was interested. Throughout the process, OSD's Chief of Chaplain's office was extremely supportive. Once Chaplain Dharm conveyed her interest, the Army moved out quickly to establish the program. Chinmaya Mission West and the three lay leaders served as the endorsing agents for the effort (every military chaplain requires an endorsing agency). Among the many tasks of establishing a new chaplaincy program was the task of establishing a new badge for future Hindu Chaplains to wear. We consulted a broad range of spiritual leaders across the nation to design the badge, including members of the White House Office of Faith-Based and Neighborhood Partnerships. The symbol "Om," which denotes truth and peace, was unanimously chosen as the new badge. Chaplain Dharm will be the first to wear this badge when approved. Since 2000, the number of South Asians in America has grown significantly. According to the 2010 Census the numbers have nearly doubled in some states. As such, thousands of Indian Americans have pursued careers of service in America's Armed Forces. With this growth comes the associated requirement to meet the spiritual needs of military members and their families. Chaplain Dharm has already reached out to members serving in SWA looking for spiritual guidance while serving high priority missions in support of national defense. Military chaplains have supported American troops since the 1700s. In 1775, the Continental Congress agreed to pay chaplains a salary of $20 a month to provide spiritual guidance for those serving in uniform. General of the Army, George Washington, directed his commanders to find chaplains of good character and exemplary lives to care for the souls of their troops. The first chaplains served a mostly Protestant military. Today's military chaplains serve in a far more diverse role. "Our motto is priest to some, chaplain to all," states Chaplain Dharm. She acknowledges her cultural background makes her uniquely qualified to take on the challenge of being the first Hindu Chaplain. She was born and raised in India, and can read and write Sanskrit, the language ancient Hindu scriptures were written in. "The basic principles of Hinduism make being a 'chaplain to all' an ideal endeavor. Hinduism by its very nature teaches tolerance, acceptance and respect for all religions, a key characteristic of successful military chaplains." While there are thousands of practicing Hindus serving in the U.S. Military, locating dense populations could prove to be a challenging task. This doesn't seem to bother Chaplain Dharm. "That's where social media comes into play." She has already made contact with Hindus currently serving in overseas locations. "I intend to utilize social media to develop a broad congregation." 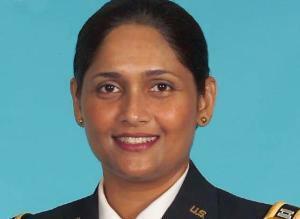 Chaplain Dharm will start her career as a Hindu chaplain by providing Hindu services at Walter Reed and the Pentagon. She also remains committed to educating America on the principals Indic religions. "For starters, Hinduism has brought the many benefits of yoga to America, and is even being used to treat some symptoms of PTSD." Chaplain Dharm offers a final word, "When service members take their initial oath, we swear to support and defend the Constitution of the United States. I can't think of a more American endeavor than supporting the free exercise of religion for all military members. That's why we serve, and I'm humbled to take on this duty to support my fellow service members and their families." Amen Padre! America is proud of you.